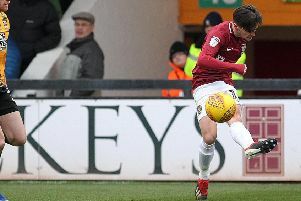 Brendan Moloney has been given the all clear after undergoing a scan on the knee injury that kept him out of the Cobblers’ win at Gillingham, but is still a doubt for this weekend’s Sixfields showdown with Blackpool. The Irishman missed the trip to Kent due to fluid on his knee but the scan came back all clear which is a big relief for Jimmy Floyd Hasselbaink. But the Town manager says he is going to have to manage the former Yeovil Town man’s workload, which has been heavy in the Dutchman’s time at the club. “Brendan should be out running again today, and we hope he should be fine” Hasselbaink said on Tuesday morning. “He had a lot of fluid in his knee over the weekend, we had a scan, and the scan has shown that he is fine, and there is nothing damaged with the knee. Shaun McWilliams stood in at right-back for Moloney at Gillingham, and it is likely the teenager will play there again against Blackpool, with his manager describing his performance last weekend as being ‘magnificent’. There is further good news on the injury front for the Cobblers, with Lewis McGugan being declared fit after a toe problem saw him miss the past two games. Midfielder Matt Crooks back out running again and well on the mend after the knee injury he suffered at MK Dons last month, and Aaron Phillips, who suffered a thigh injury at Charlton in August, also close to returning to full training. “Matt is running,” said Hasselbaink, who said he thought the midfielder would be missing for at least six weeks when he suffered the injury on September 26. “He is not ahead of schedule, but he is going in the right direction. Hasselbaink will also have his attacking options boosted for the weekend, as Alex Revell is available again after serving his three-match ban for his sending off against Bristol Rovers, and the Town manager confirmed John-Joe O’Toole is 100 per cent fit. The midfielder was taken off just 64 minutes into the win at the Priestfield Stadium, but Hasselbaink confirmed that was always the plan after the player was handed his first start of the season. The one player still some way off a return is central defender Leon Barnett, but Hasselbaink confirmed he is having the boot that has been protecting his injured Achilles removed. “Leon is getting out of the boot on Monday, and hopefully he will get the all clear to start doing some grasswork as well,” he said. Supporters are reminded that Saturday’s clash with Blackpool kicks off at 2pm, to avoid a clash with the Saints’ Aviva Premiership match with Wasps at Franklin’s Gardens.